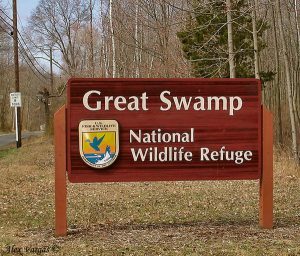 New Jersey’s Great Swamp National Wildlife Refuge consists of a little over 7,600 acres and was established on November 3, 1960, by an act of Congress. The swamp is an important feeding and resting area for more than 240 species of birds. Other wildlife inhabiting the swamp include fish, turtles, deer, fox, and muskrats. The Great Swamp was designated a registered National Natural Landmark in 1966 under the Historic Sites Act of 1935. The Great Swamp sits in a natural basin that was formed as the glaciers from the Ice Age began to recede. Along with the basin, the glaciers left rocks and earth that today make up the Basking Ridge. Historians have found evidence that humans inhabited the Great Swamp 12,000 years ago along with giant beaver and mastodon. The Lenape, a Native American tribe were living in the Swamp as far up as Canada, when the first European settlers arrived. Eventually, the settlers built villages and towns in the area, some of which are still standing including New Vernon, Green Village, and Meyersville. The Great Swamp has three public facilities and eight miles of trails that wind through the wilderness. These are accessible only by foot, but the experience is completely worth the trip. Walking through the swamp takes you back to primeval times and the Swamp is a bird lover’s dream. The Lord Stirling Education Center is located on the Swamp’s western border. The Center includes an Art Exhibition Hall, an Auditorium, classrooms, a bookstore and gift shop and a resource library. The Center offers educational programs all year long. The National Wildlife Refuge Headquarters includes an Observation Center that has interpretive trails, a boardwalk, an informational kiosk, and restrooms. The Great Swamp Outdoor Education Center is the Nature House. It has natural history displays and hikers are welcome to walk the two miles of trails. ← What Is The Bureau Of Land Management?